As Kodavere is adjacent to Lake Peipus (Peipsi järv in Estonian and Чудское озеро [Chudskoe ozero] in Russian) much of the archaeological and cultural heritage is intertwined with “maritime” interactions whereas the lake has been the connector and divider, as the saying goes; also the case with the Russian Old Believers. In order to enhance the understanding of landscape development and perception it is a good idea to overcome binary dichotomies of mainland and lake and see it as one ecosystem. Peipsi has been immortalised for Estonians by poet Juhan Liiv from the turn of 19th–20th centuries, whose farm museum we have used for previous workshops. Whilst navigation was left to the three member crew professionals passengers had the opportunity to listen to the lectures and of seeing ancient harbour sites “from the other side” of the lakescape. The phenomenological feel and embodiment of historic “seafaring” was quite clear as mid-way the wind direction did not favour us causing waves slightly over meter resulting in some food loss. Juhan Liiv had a piece where two men are crossing spring ice promising chandelier for church and never to cheat the merchant upon safe arrival. When safe, they brought only a candle instead and carried on cheating bit-by-bit. We even did not bring a candle. The Emajõe-Peipsi barge (lodi in Estonian) is a unique wooden trading vessel, developed from archaic Hanseatic cog (koge in Estonian), changed little over the centuries. 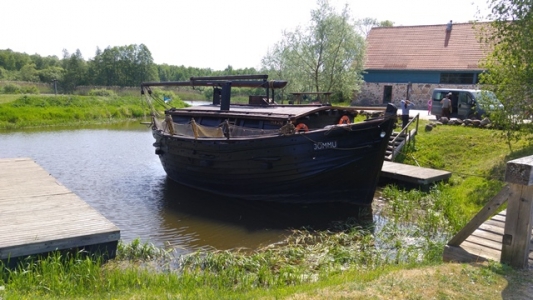 The unusually round and flat-bottomed hull of the barge made it perfect for navigation in the shallow waters of the Emajõgi River and Lake Peipus and land in the rather challenging port locations characteristic of the region. In urgent windless cases, the barges were towed from the riverbanks with long cotton ropes. Peipsi barges sailed the inland waters, since the 14th century, for more than 600 years. When the Hanseatic League dominated trade across the Baltic and North Seas during the 14th–16th centuries, Peipsi barges heading for Novgorod carried mainly salt, cloth, beer, sweet wine and oriental spices, on the return, they brought furs, honey, and wax – thus contributing greatly to the prosperity of several Estonian towns. The storage capacity was up to 200 tons of cargo on the biggest ships. The 19th century was the prime time for Peipsi barges, when there were more than 500 on Lake Peipus. Tartu townspeople needed firewood and food, coach horses needed hay – for this separate markets were found along the bank of the Emajõgi River. The crew was usually very small: most of the time there were just three people quartered in the stern and forecastle. The leisure time of the barge merchants was happily spent listening to an accordion or partying in the numerous city taverns. Waiting for a favourable wind could take sometimes several weeks. Most of the sailing barges were lost in the turmoil of the two world wars, when they were requisitioned as efficient military landing ships. By this time the magnificent square sails had been removed and the barges proper were being towed by engine-powered vessels. The building of the new barge started in 2004 when no living barge craftsmen were alive. Planning and designing materials were gathered from different museums and every single detail was made by hand by the new masters on the spot, including nails and ropes. On April 29th, 2006 Jõmmu was ready – only of its kind in the world. The barge Jõmmu is 12 m long, 7.5 m wide, weighs 20 tons, the mast is 14 m and area of the sail is 100 m2. The water depth has to be 80 cm minimum. A small motor was added for the contemporary necessity. The crew usually consists of three persons and 36 people can step on-board, sleeping facilities are available for 15–20 persons. It is used for study trips and festivities, plays, cinema and concerts. Jõmmu has toured inland waters but also Latvia, Sweden, Finland and Russia. In 2016 Jõmmu was celebrating its 10th anniversary and more than 100,000 passengers have had the pleasure. After the WWII seafaring and sailing was forbidden in the right fear of people fleeing the West. Recent years and accumulation of wealth with more spare time sea-culture is on the rise as well as the number of historically reconstructed boats and ships. 2016 has been titled as the year of maritime culture in Estonia. What is the Barge "Jõmmu"? For costumes of the different municipalities click here and here.